When you start Jaksta Music Miner for the first time you will be presented with a Welcome screen. This screen lets you select a user interface to use - Beginners, List View and Adavanced. 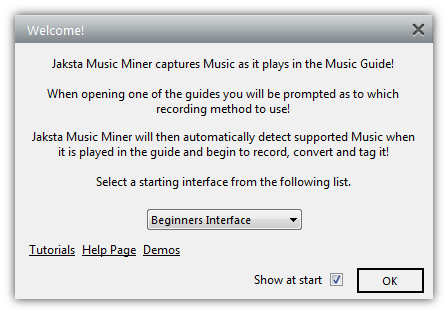 If you havnt used Jaksta Music Miner before then use the beginners interface. Once you know your way around you can the customise the interface how you would like. The welcome screen also contains links to this guide, the Demonstration Videos page which provides instructional videos and also to the tutorials. You can choose whether to display the welcome screen at startup or not by checking or unchecking the "Show at start" checkbox in the bottom right corner of the screen. The tutorial screen provides a graphical overview of how to perform most tasks. You can choose whether to display the tutorial screen at startup or not by checking or unchecking the "Show at start" checkbox in the bottom right corner of the screen. You can open the tutorial screen at anytime via the Help > Tutorials menu. When you start for the application for the first time, the default module is the Library. The Library displays all audio that you have downloaded or recorded. Subsequent starts will default to the last module you were in when you exited the program. 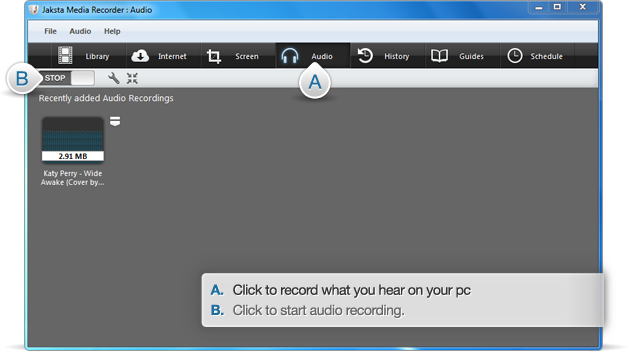 From the library you can select the type of recording (Internet or Audio) you would like to do using the drop downlist. When you change the recording type the toolbar icons will adjust for that recording type. If you have selected to display a modules tab then these controls also appear on that tab. The Library has two types of views. A list view and a thumbnail view. To change views select the one you want from the toolbar. 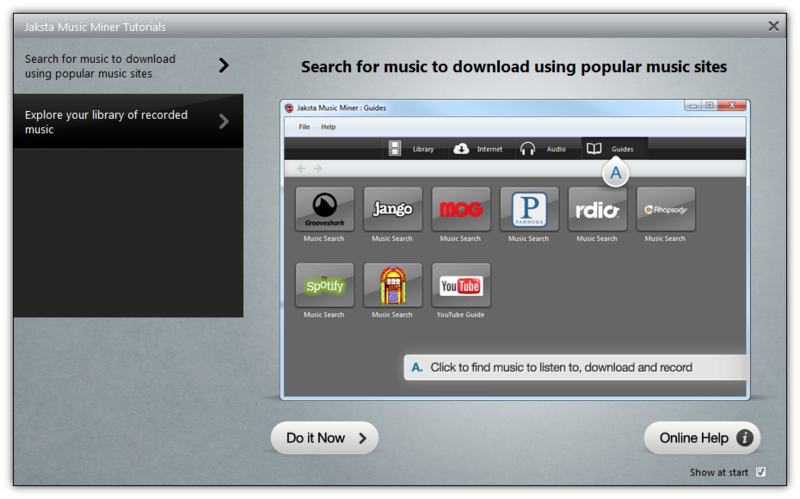 The thumbnail view displays an icon for each download or recording. The icon will be taken from an image lookup from the internet. You can change the image on the Properties form. The context menu button in the top right corner of each thumbnail displays action menu items that apply to that item. This menu can also be displayed by right clicking the item. Double clicking an item will play it. If there is a progress bar across the item, double clicking the progress bar will display the Properties dialog. Renaming an item is similar to renaming a file in Windows Explorer: To rename an item, click the name. Use the Escape key to cancel or Return key to confirm. The list view displays a row for each item with columns containing the date, name and status of the item. It also displays an icon indicating the status. To display the context menu for an item(s) select the item(s) and right click. Alternatively select the Library menu. There is a virtual folder for each module that contains downloads and recordings for that particular module. You can create your own folders via Library > Folders > New Folder menu item. Each module also has a default output folder and you can change this using the toolbar icon on the appropriate module. You can drag both thumbnail and list view items to folders you create. You can show or hide the folders via Library > Folders > Show folders menu item. You can show/hide individual default folders under this menu as well. You can import items into your library by drag and dropping them from Windows Explorer. When viewing a folder you have created you can import all media in that folder by Library > Folders > Synchronize. No recently added: The number of items that will appear in the Recently Added view of each module after which a "More" icon will appear. Clicking this icon will display the next page of items. Small Interface/Always on Top: When checked and using a modules small interface, the small interface will be the top most window. To reset to the default settings. Click the Defaults button. The Library module contains a drop down list of preset conversion settings in the toolbar. Selecting a preset from this drop down means that any download, recording or conversion started after the preset is changed will be converted to that format. By default converted items are created in the Media folder. You can change the output folder using the Output Folder menu item to select a new folder. To automatically import recorded, downloaded and converted media into iTunes, select an iTunes supported conversion settings and check the Import into iTunes item at the bottom of this menu. 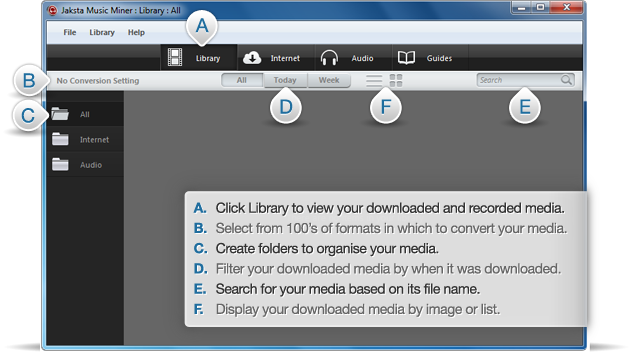 The Library > Convert menu will allow you to select one or more media files from your file system to convert. These files can be out side of your library and will be imported if required. The Library > Fix FLV menu will allow you to select one or more FLV files from your file system to fix. For more information on fixing FLV files please refer to Fix FLV in the Internet section of this guide. The Library > Meta Data/Tags menu will allow you to select one or more media files from your file system so you can change the ID3 tags. Double click a tag to change the value. General Tab: Displays information such as Name, Location, Size, Source and Image. You can change the name and image. To view the file in Windows Explorer click the folder icon next to the location. Meta Data/Tags: Displays and allows the modification of ID3 tags if the fomat supports it. If supported double click a tag to change its value. 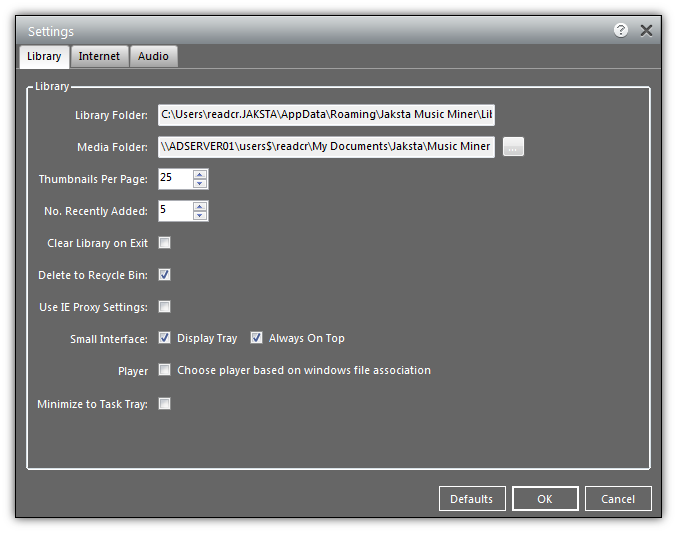 Jaksta Music Miner is a guide based recorder and downloader. Use the extensive builtin guides to find, listen to and download and record music. We are adding new guides all the time so be sure to always use the lastest version. When you open a guide you may be prompted for the best method to download or record from that guide. If you are not prompted then the guide will allow you to directly download from within it. Some guides provide the ability to download directly from within the guide itself. 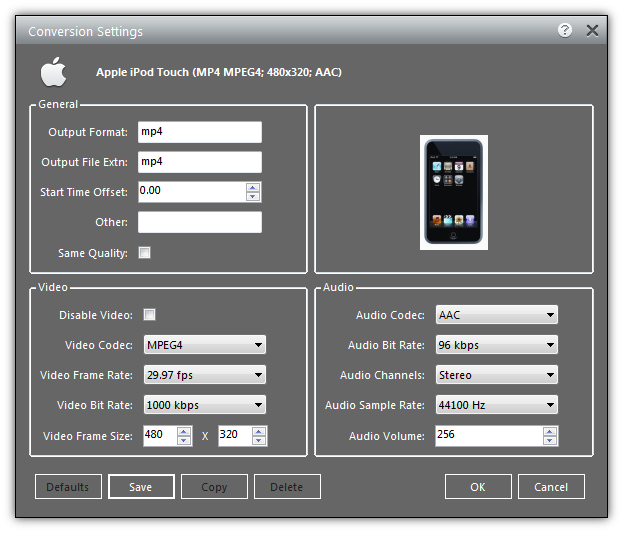 Others require Internet monitoring or audio recording to be switched on to capture media as it plays in the guide. Where Internet monitoring is required to capture, you will prompted to switch it on when the guide is open and it will be switched off when the guide is closed. At any time you can change the default output folder that recordings and downloads will be saved in by clicking in the toolbar. 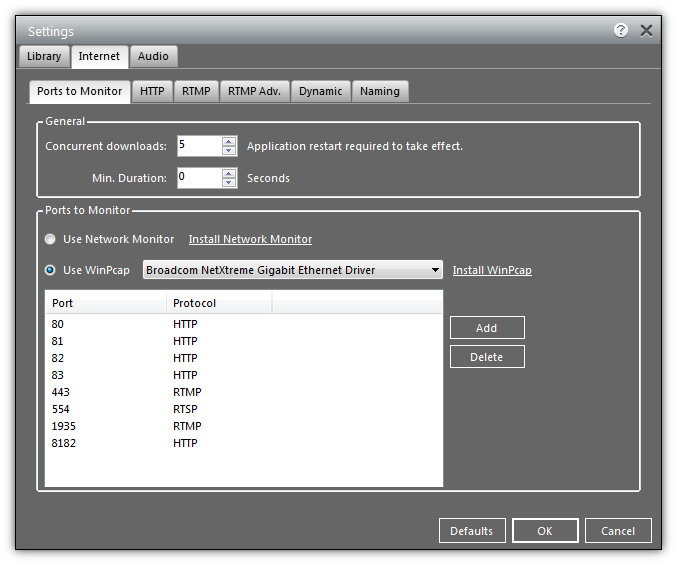 Select from the Internet Monitor or Winpcap as the network driver. Use the Internet Monitor if you are capturing over a VPN. To increase the speed of HTTP downloads, Music Miner can use a method called segmented downloading. This is where a single download is broken to several smaller downloads (segments) and each is downloaded at the same time. The speed boost obtained is dependent on your network connection, your computer and the server streaming the video or audio. Here you can configure the number of segments to break a download into and the minimium size a segment can be. If a download is failing and you see in the Progress log that segements are failing, turn the Max number of segments to 1. Some sites that stream RTMP will also try and secure it with a technology called SWF Verification. It is illegal for our products to respond to SWF Verification requests so we ignore them. This will cause the server connection to then drop after a period of time. 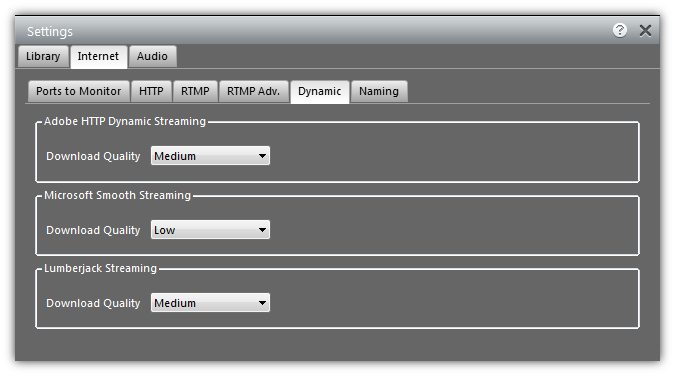 The following settings allow you to control how these secure streams are handled. 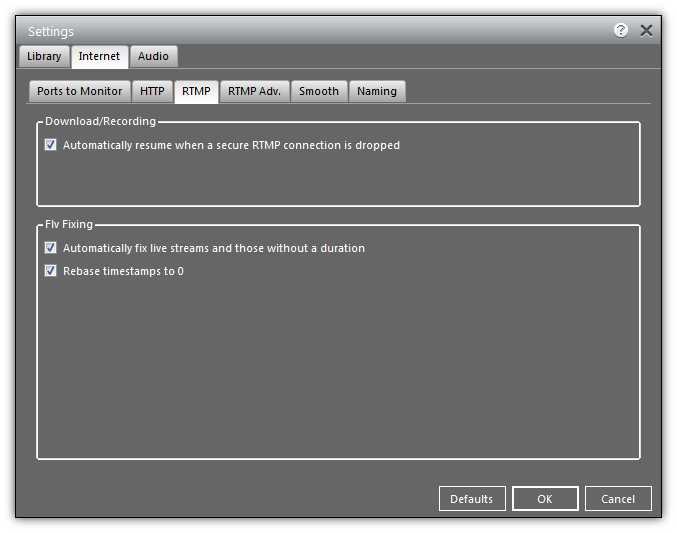 Automatically resume when a secure RTMP connection is dropped: Enable this and the download will automatically restart each time the connection is dropped. Live streams such as webcams sometimes send incorrect timestamps. This means the file created for the download plays back incorrectly. The following settings allow you to control how these are fixed. The RTMP protocol allows us to request the amount of data the server should send in each chunk. Requesting a large chunk means that in many instances the download will happen much faster than the playback speed. The following settings allow you to control how this Super Download feature works. Super Buffer size (seconds): The number of seconds of data the server should send when attempting a Super Download. Microsoft Smooth Streaming is an adaptive streaming protcol which means that the quality of the media displayed to the user changes in real time as the user watches based on their internet connection. Therefore there are many different stream qualities available. Select the quality you wish to download from the drop down list. Adobe HTTP Adaptive Streaming is an adaptive streaming protcol which means that the quality of the media displayed to the user changes in real time as the user watches based on their internet connection. Lumberjack Adaptive Streaming is an adaptive streaming protcol which means that the quality of the media displayed to the user changes based on their internet connection. Referer: HTTP request can contain what is termed a referer which identifies the url of the page which made the request. If the detected streams request contains a referer then the title of this page will be used as the name. HTTP Title: The application keeps track of all visited HTML pages. The domain name of a streams url will be used to lookup the last page visited in that domain and that page title will be used. Extended HTTP Title lookup will occur once the download is complete. 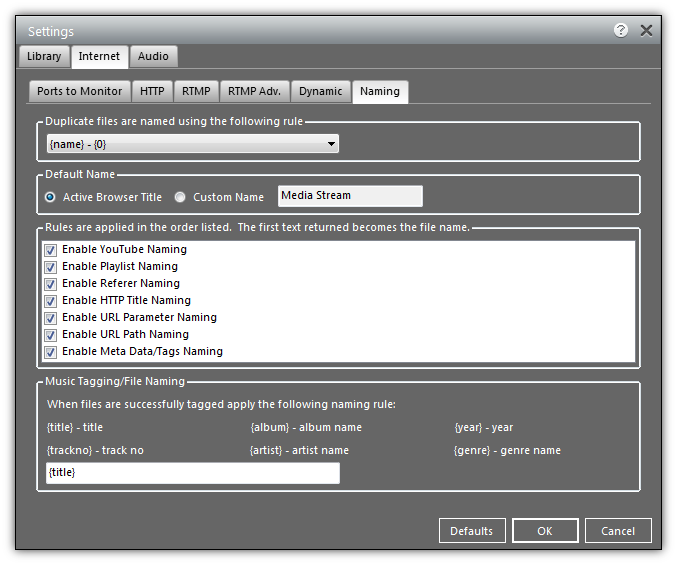 URL Parameter: The streams url is searched for parameters such as title= or name=. If one is found then that will be used as the name. Extended HTTP Title lookup will occur once the download is complete. URL Path: The file part of the streams url will be used. For example http://www.jaksta.com/some/path/file.mp3 the name would be file.mp3. Extended HTTP Title lookup will occur once the download is complete. Meta Data/Tagging: The resultant file will be examined for ID3 tags. Applies to file types that support IDS tags (MP3, MP4, WMV, etc) - not FLV. Identify and Tag: Audio finger printing is used to identify and tag MP3 files. Extended HTTP Title: The application keeps track of all visited HTML pages. The streams domain name is used to lookup the last 5 visited pages. Each pages content will be examined to see if the streams url appears in the page. If it does then the title of that page will be used as the name. Audio recording is a great way to capture copy protected music. Music Miners's audio recording is unique in that it records audio driectly from an application (like a browser or Spotify) and does NOT mix the sound from different applications together. This means that if you are recording Spotify and someone rings you on Skype your conversation will NOT be mixed in with your Spotify recordings! Music Miner also audio fingerprints audio tracks and lookups up things like title and artist of songs as well as the art work - these details are then saved to tags in the file! Cool Hey! Start recording by clicking the Start button in the toolbar. The Audio module will glow blue whist recording. At any time you can change the default output folder that recordings will be saved in by clicking in the toolbar. Output Format: Either MP3 or WAV. 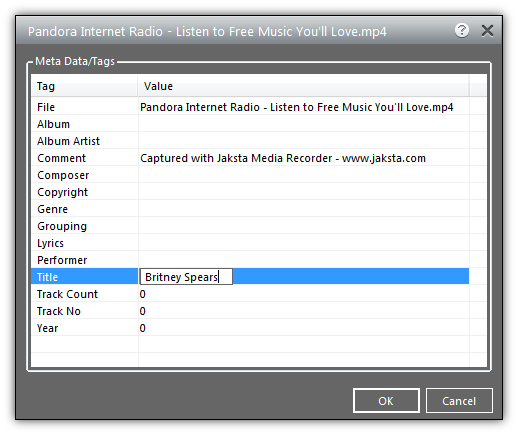 If MP3 you can also select the output rate. Record Silence: Silence based on the parameters above will be recorded when this is checked. When unchecked silence is not recorded. Split on Silence: The current recording file is closed and a new one opened when silence is detected based on the parameters above. 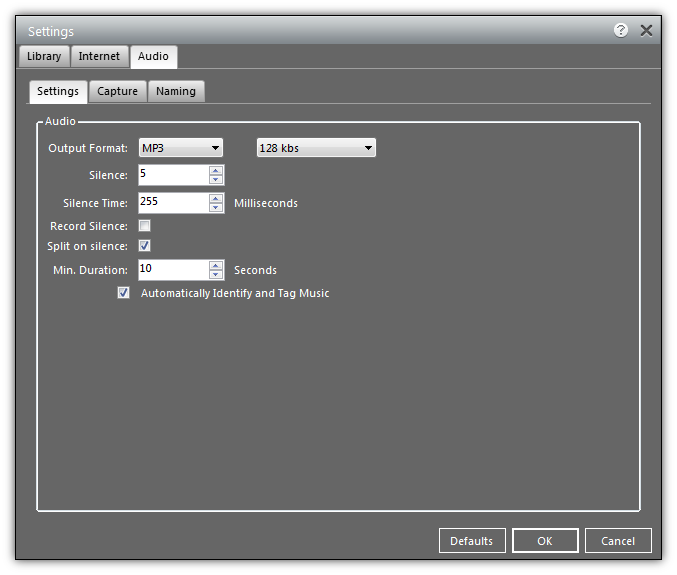 Minimum duration: Recordings less than this value are automatically deleted. This can be used to remove ads. 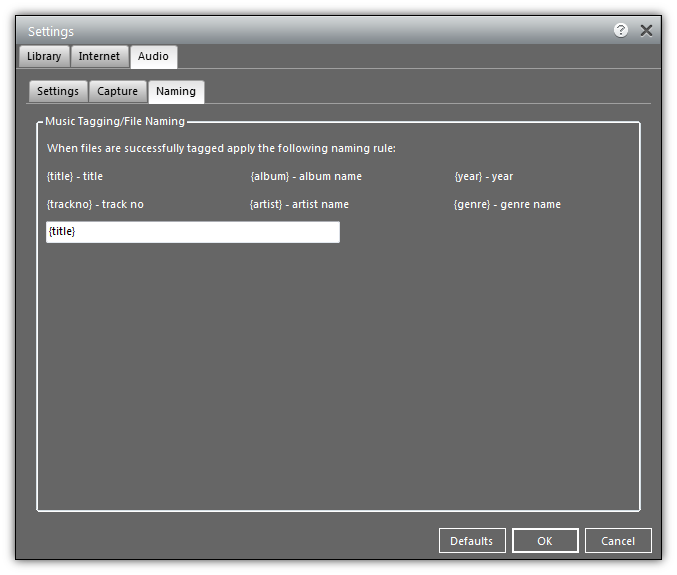 Automatically Identify and Tag Music: Enables audio fingerprinting to lookup title/artist information. 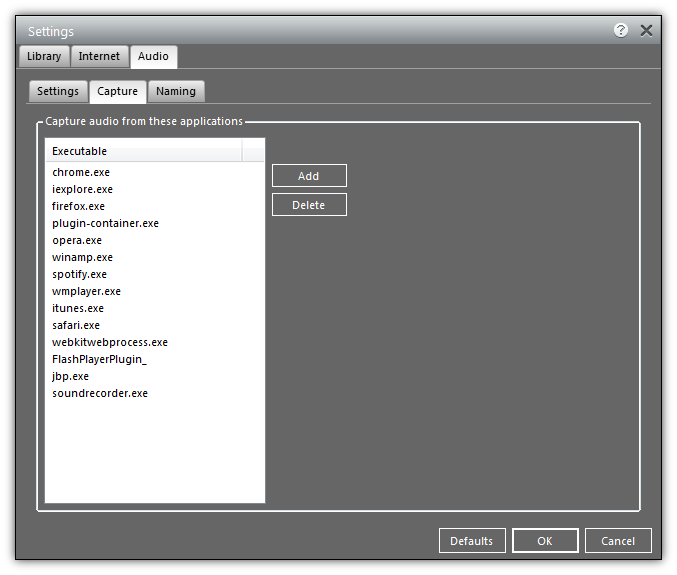 On the Audio Capture tab you can add and remove executables that audio will be captured from. If its not in this list the audio will not be captured from it. 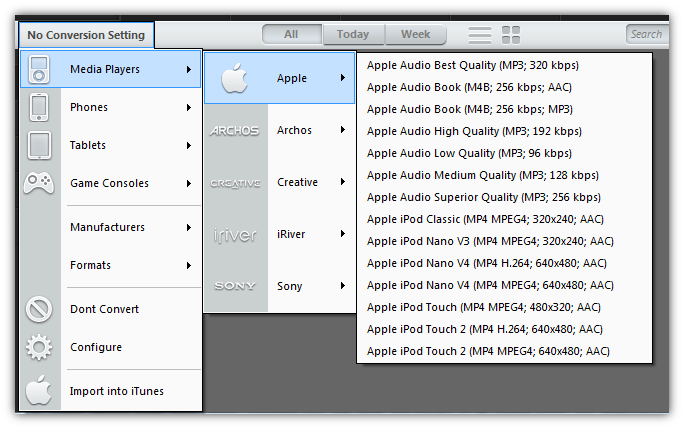 On the Audio Naming tab you can specify how you would like your audio recorded media named.